For the past year of so I've been particularly interested in natural and organic skincare. There's just something so intriguing about the science behind a lot of natural products that don't rely on fillers or fragrance to give them appeal. One brand that I have recently discovered is EKIA - a certified organic range from France. 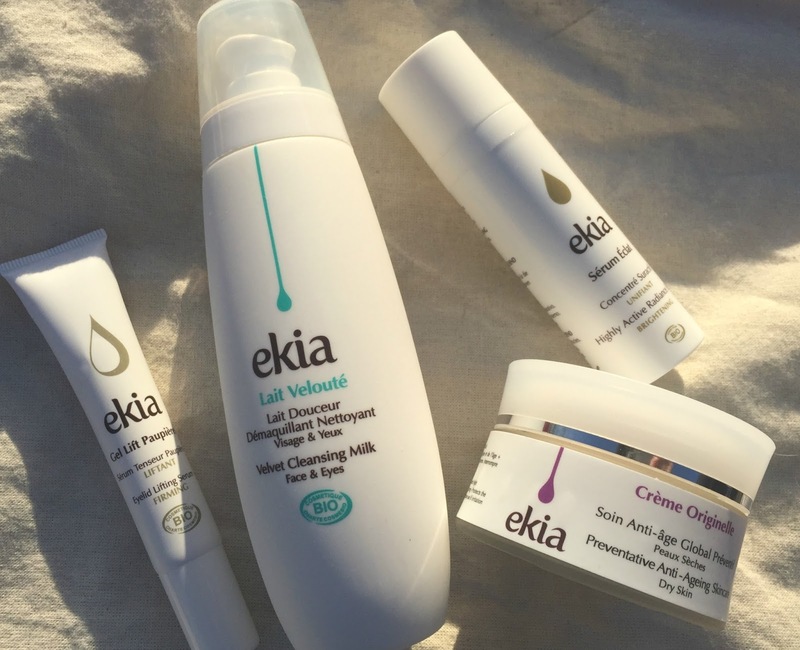 EKIA is unique in that the products are designed to complement three different mature skin types. In other words, it's not a 'one size fits all' anti aging range and regimes are 'prescribed' according to each individual's needs. The creator of EKIA, Carine Mudry worked with Dermatologists and conducted a clinical study to find the ideal natural anti-aging ingredient. Carine's work led to the discovery of the brand's signature active ingredient- Sangre Del Drago Sap, also known more simply as Dragon's Blood Sap. Incredibly, this deep red sap comes from the Croton Lechleri Tree which grows in the Amazon Rainforest and has been used for thousands of years by local tribes for its healing properties. That's saying something now isn't it? Intrigued by the inclusion of this interesting-sounding, almost mystical sap I was keen to try some bits from EKIA and received a skincare prescription of my very own so I could do just that. From the moment I first put this on my face, I knew I was onto a winner. This cream is thick and buttery, which is just what I want at the moment, and feels lovely and rich on the skin. The cream is designed to reduce the first signs of ageing and is made up of 99.2% of ingredients from natural origin. Ingredients include the Dragon's Blood Sap, Maca Root, Cork Oak, Paracress, Pracaxi Oil, Marine Microorganisms(! ), Baikal Skullcap, Bearberry and Green Caviar. Nope, I hadn't heard of most of these before either. You'd think all of these ingredients would produce a most interesting scent but in reality, Creme Originelle does not smell of much at all. The scent is subtle with almost a hint of almond. This cream seems to instantly have an effect on my skin - it makes things plumper and brighter and leaves my face feeling unbelievably hydrated and cared for. RRP £43 for 50ml. This is a no-rinse cleanser designed to remove make up and general muck. The milk is massaged over the skin, eyelashes and eyelids (it doesn't sting) and then removed with a cotton pad. Although this cleanser does leave my skin feeling refreshed and cleansed, I have never been one to be content with not actually washing my face so to me this is a first cleanse/ make up remover. The cleansing milk is enriched with a combination of oils, butters and waters from the Amazon including Andiroba Oil (an anti-inflammatory), organic Pracaxi Oil (to moisturise) Brazil Nut Oil (to nourish and restore), Cupuacu Butter to relieve dry skin and fair trade Guarana Water which has a toning and decongesting action.The cleansing milk also features extracts of Argan, Barley and Shea Butter, Acai and Candeia extracts and the signature Dragon's Blood Sap. RRP £19 for 90ml. I feel like everyone needs to know about this one, especially if you're interested in brightening up your complexion. This opaque serum (I don't know why but I always assume serums are going to be clear) is packed with fruit acids and Licorice Extract to exfoliate and even out skin tone/ pigmentation then nicely rounded off with hydrating Cranberry Extract and, of course, regenerating Dragon's Blood Sap. I love an active serum and this one is no exception. I feel a very, very slight tingle on application as the Blueberry, Lemon, Orange and Sugar Cane acids do their thing then my face is left feeling and looking super smooth and happy and ready for application of Creme Originelle. RRP £56 for 30ml. This serum is one of those products that has an instant effect and works to improve things over time. At 31 I am still a bit young to have an age-related issue with my eyelids sagging, however I do have quite deep-set, hooded eyes so anything that's going to firm up the area is more than welcome round these parts. The gel-like serum has a cooling effect and is applied to cleansed upper eyelids using gentle 'smoothing' movements from the inner to outer corners of each eye. As the formula dries, you feel an instant lifting sensation - this is down to the inclusion of Carrageen Moss Extract which forms a micro mesh on the surface of the skin. While the moss extract is working on the instant results, other ingredients focus on long term effects; Hyaluronic Acid hydrates, Alpine Sea Holly extract firms and strengthens and Dragon's Blood Sap lifts and regenerates. RRP £38 for 15ml. It's worth mentioning that EKIA products come with little leaflets that include dietary tips and step by step instructions for firming facial massage, which I think is a nice little bonus! You can find EKIA at Whole Foods stores in the beauty section, .